Are you looking for a new natural deodorant? You need to try milk of magnesia. I stumbled upon milk of magnesia as deodorant more than four years ago, when I was having a terrible time finding a safe, natural deodorant that didn’t make me break out in a rash. I decided to give it a go and have never looked back. I’ve tried many natural deodorants over the years, but milk of magnesia is hands down the BEST natural deodorant I’ve never used. 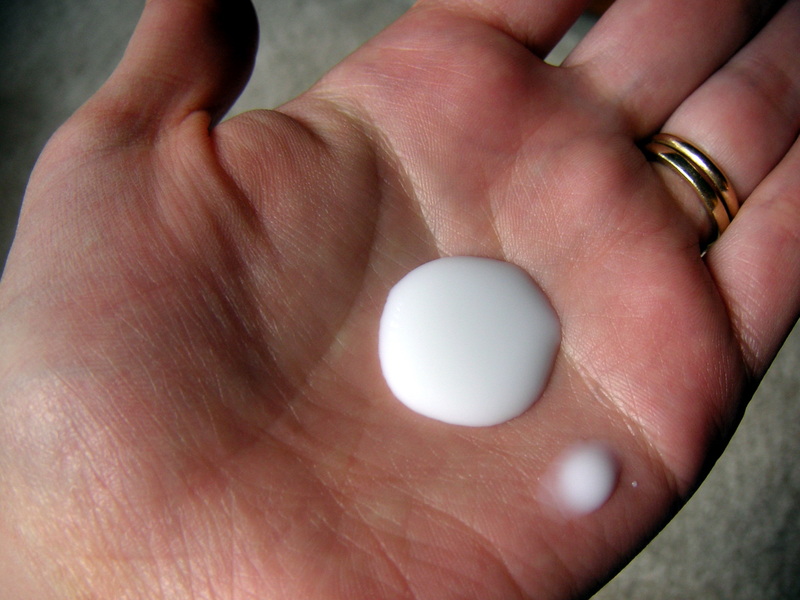 If you’re like me, you may never have heard of milk of magnesia before. Milk of magnesia is magnesium hydroxide suspended in water. It’s most commonly used as a laxative. For reasons that I don’t entirely understand, though, it also makes an awesome deodorant. Low cost: Milk of magnesia is very inexpensive. I currently pay about $3 for a 12 ounce bottle that lasts me several months. This is a huge savings over the price of most commercial natural deodorants. No residue or stains: Milk of magnesia doesn’t leave stains or residues on my clothes. Some of the natural deodorants I’ve used in the past were not so clothing-friendly. No irritation: Milk of magnesia doesn’t irritate my skin at all. It also doesn’t sting when applied after shaving, which is a nice side benefit that can’t be said about all the deodorants I’ve applied. No assembly necessary: Most homemade deodorant recipes I’ve seen have been quite simple to put together, but even simple recipes can seem daunting if you’re already feeling overwhelmed. I like that the milk of magnesia is ready to use right out of the bottle. You can find milk of magnesia at most grocery stores or pharmacies. Make sure you buy a variety that’s just magnesium hydroxide and water. Many varieties also contain flavoring agents, food dyes, sugars, and/or preservatives, none of which you want in your deodorant. I always buy this brand from Amazon. I don’t mind applying the milk of magnesia with my fingers, but if you find that too messy or inconvenient you may want to check out this milk of magnesia-based deodorant from the People’s Pharmacy. It’s much more expensive than just buying milk of magnesia, so I haven’t actually tried it myself, but the reviews look good. Pour about a nickel-sized amount of liquid into your palm. Use your fingers to apply the liquid to your underarms. Allow your underarms to completely dry before putting on your shirt. You can also experiment with various other techniques, if you want. Some commenters have mentioned leaving the milk of magnesia uncovered for a while so it becomes a thick paste rather than a liquid. Do some experimenting and see what you prefer! Everyone’s different, so milk of magnesia may not work for you as it does for me, but if you’re in the market for a new natural deodorant I’d recommend giving it a try. If it doesn’t work you’ll probably only be out a couple of bucks, which is not something that can be said for most natural deodorant options. What do you use for deodorant? Have you found something you love or are you still looking? Natural deodorant has been my nemesis. It's the one thing I haven't been able to change out effectively. Anything with baking soda breaks my arms out. And, other things have controlled odor. I will definitely try this. I'm thinking if this controls odor, then the addition of some of my natural powder would probably help control stickiness. Thanks for the great tip! I have never heard of that. I use a homemade coconut oil based one also- but sometimes I just use regular because it takes awhile for the oil to soak in. Does the Milk of Magnesia dry/absorb more quickly? Hmm...I think I usually give it about three to five minutes or so to dry. You can make it go faster by fanning air underneath your arms. I'm not sure if that would be shorter or faster than what you're using now. I'm about out of coconut oil deodorant. I think I'll try this! Nice! You'll have to let me know how it goes for you. I'm so excited to see this!!! I too had issues with a rash with the same deodorant you did, but hubby is fine using it. I am definitely getting some milk of magnesia! So excited to try this out!! Saying hi from "Fat Tuesday"
Thanks for stopping by, Kristina! I hope it works out for you. Oh, and I tried to leave a comment on your blog but I couldn't sign in with any of the comment options. I just wanted to tell you that I enjoyed reading your "story of us." That's quite the story! Please do an update post on this down the road! I'd sure love to know how it works for you!! Thanks for commenting, Mrs. Z! So far it's been working great for the last two (now three!) weeks, but I will certainly update here if things change. I'd encourage anyone interested to just try it for themselves,though, as you can buy milk of magnesia very inexpensively. Magnesium is pretty much THE solution for body odor. You might be interested in this blog post by Cheeseslave: http://www.cheeseslave.com/how-i-quit-using-deodorant-with-magnesium/ I have climbed into a magnesium bath with the kind of stinky pits that come on suddenly, like just showered a couple hours ago and where did this come from kind of stink, and the smell goes AWAY without ever submerging my shoulders or washing or anything! Seriously. I was blown away the first time I did it. I do still use soap to wash but the magnesium takes care of smell all on its own. You might look into the benefits of magnesium and do a little research as to why most Americans are deficient these days. My DNP says while calcium supplementation gets all the publicity it's magnesium that she focuses more on. I found your post through Real Food Forager's Fat Tuesday. Thanks for commenting, Bebe. Yes, I read that post by Cheeseslave when she first wrote it - fascinating stuff! I've been supplementing with magnesium oil for the past few months now. It doesn't seem to have made any difference in body odor for me, though. Perhaps I'm just really deficient so it's going to take a while! Anyway, thanks for sharing your experience! That's why I think the therapeutic baths are so awesome. I'm pretty sure I was way deficient (had most all of the symptoms) but I bit the bullet and bought the magnesium flakes (mag. chloride), even though they were expensive, and alternated between those and Epsom salts (mag. sulfate), which are super cheap. I dumped 3-4 cups in each bath... the info says more is even better. I was doing a detox protocol for mercury (I'd just had a whole mouthful of amalgams removed) and Epsom salt baths were a part of that. My family thought I was just taking a lot of me time, I was soaking nearly every night. ;) But, it did it's job. I got my magnesium level up in less than two months AND when my bloodwork came back my DNP said it was nearly the best she'd ever seen, every single heavy metal was under the negligible mark! As an aside to my experience, my 16yo daughter, who is a competitive athlete and includes kettlebell and interval training workouts, was able to give up deodorant/antiperspirant after just a few mag. baths and switching to a couple squirts of mag. oil under arm in lieu of deodorant. This is a girl who complained that the natural deodorants were just not effective and resorted to using nasty aluminum-laden antiperspirant! We also take an oral magnesium supplement daily, for maintenance. Plus we work hard to eat no unsoaked/soured grains or nuts, which can leach minerals from your body. That's so interesting! I didn't realize that magnesium helped you detox. Hmm, now I'm wondering if I should try some baths with magnesium flakes. Thanks so much for sharing here! Bebe - Have you heard anything that would contraindicate topical magnesium chloride for those with hypothyroidism? I started using the spray daily, and started having strange side effects such as weight gain and nightmares. It could be coincidence, but I can't find a good naturopathic practitioner in our area to even ask. BTW, I highly recommend the book "The Magnesium Miracle". Magnesium is critical for many body functions. I'm just trying to figure out now the best way to increase my intake. I found your post at Real Food Forager's Sunday snippets. Thanks for sharing. No contraindication at all. Magnesium is a relaxant mineral and it seems incongruous that it would cause nightmares. But the thyroid, adrenals and ovaries are a trinity that work together and when one is out of whack the others are affected. Weight gain can be hormonal (ovaries) or adrenal related too. I have been on Armour thyroid since 2003 and my nurse practitioner (who was an ANP and has now gone back for the highest level of training for a nurse practioner, DNP, or Doctor of Nurse Practitioner) is the one who diagnosed my thyroid and adrenal issues back then (when standard medical care said I was fine) and has greatly encouraged me in my quest to get my magnesium levels up. In her opinion magnesium is the most important mineral the needs to be addressed at this time. BTW, my DNP is a co-owner of the integrative medical practice where I go. They use many alternative practitioners including naturopaths, massage therapists and acupuncture/Chinese medicine. I encourage you to find someone like that! I do a LOT of research and prefer to manage my health as natural as possible but it is SO nice to have someone who knows more than me that also prefers to use the least intrusive, most natural treatments. I take magnesium orally, about 300 mg daily, plus I use the Ancient Minerals magnesium flakes in my bath, PLUS I made my own magnesium oil out of those flakes and I spray it on after a bath or shower (and I do not rinse it off) and I spray it on my underarms every day instead of deodorant. Hi bebe, where do you live? I have been looking for an integrative practitioner in south Florida. Yours sounds great and I'm praying on the off chance you're somewhere near me. FYI I am also planning to try the Ancient Minerals oil spray as deodorant and also their lotion. Thanks! Sorry Ashley, I live in Alaska, as far away from you as I could be in this country! Whoa, I'm running for the bath as soon as I post this comment. I can't wait to try both the deod. and the baths, as I've struggled with odor forever. I stopped using the nasty stuff because it didn't work, so there wasn't even a point. Other tricks like witch hazel and apple cider vinegar have also not worked for me. I can't wait to give this a shot. Thanks, ladies! It probably works because it is alkalising. The bacteria that causes BO and other smells thrives in an acidic environment. That's it. It's that magnesium deficiency. You are what you can absorb. That's why I'm taking mineral supplements that you mix into water prescribed by a veterinarian. Yes! You heard it right! Thanks so much for this information, I too have had a rash from the homemade version but I tried the milk of magnesia and it works perfectly! Magnesium is the best deodorant - hands down! I use magnesium oil spray (Ancient Minerals has one; Swanson Vitamins is cheaper). It stings when I first put it on, but settles rather quickly. Also, I recommend cutting by half with distilled water to cut down on the stinging somewhat. I spray my armpits and arms and legs. No natural deodorant can even get close to the effectiveness. The magnesium oil spray is beneficial as it's in a form that your body can transdermally absorb and not only keeps odor away but keeps your magnesium levels healthy! I use a combo of magnesium oil ( made from Ancient Minerals flakes ) and magnesium oxide powder. I had the same experience with the sting. At first it stung a lot but now, not at all. I've wondered too whether that might mean your magnesium levels are rising. Seems like a good question for Dr. Mark Sircus? I have been using Milk of Magnesia for several years and I will never use anything else! It dries fast, you don't need much, and it has Never stained my clothes. I highly recommend it! That's great to hear, Jeanette! I couldn't find much information from other people when I decided to try it so it's nice to know that it's a good long-term option! Wow, this has been an education! Thanks, everyone, for your comments! Hi. Was wondering if the Milk of Magnesia is effective if watered down. Was wondering if I just put it in a roll on bottle right out of the original bottle. Can anyone tell me? I was also wondering if there is a way to take magnesium pills, add a bit of water and then add it to the roll on bottle. Wondering which would be better. Juliet, I haven't tried either of the things you proposed. I would assume, however, that putting the milk of magnesia in a roll on bottle right out of the original bottle would work best. I don't think you'd have to water it down to get it to come out, although I could be wrong. I am so grateful you wrote this post. I read it when you posted it, but didn't actually try this until this weekend. I am one of those people who have not had success with any other 'natural' deoderant. Sometimes the stink would come on even if I used an aluminum laden anti-persperant. This has so far worked beautifully for me! It is such a blessing to not have to worry about always stinking wherever I go! Thank you, thank you, thank you! I have used Milk of Magnesia for a couple weeks. I had the stinky underarm problem and tried lots of different deoderants. The Milk of Magnesia works great, even with a work out. Just used a small amount on a disposable cotton pad, let dry or use a hairdryer to dry before putting on clothing. Thanks for sharing your experience, SSR! I'm glad it's working well for you. Thanks, Jasmine! I just discovered your link-up last week and am so glad I did! There's a lot of great stuff there. Hi Meghan, I've just found your blog via a Google search on the topic. I'm all set to buy a bottle tomorrow but I have a question. What about residue when you raise your arms? It's summer time and I'd love to wear sleeveless shirts every now and then. How can I put on the MOM without having a weird looking dried stain under my arms? Hi Terr, for some reason your comment got stuck in my spam filter and I only just found it. Sorry about that. I'm guessing you already bought the milk of magnesia? I haven't paid very close attention to the stain issue in the past, but I wear sleeveless shirts,too, and I haven't noticed stains under my arms. I will have to look out for that and get back to you! If, however, you've already tried it yourself, have you noticed any staining? Hi Meghan, Yes, I tried it. It didn't dry up weird. However, I noticed that it didn't work for too long. Maybe it takes a few applications to really kill off the odor-causing bacteria? What I did notice is that it does dry up the pores of my skin a bit, so that was nice. I also noticed another side-effect; I noticed that I was more, um, "motivated" to "eliminate". Any chance that the magnesium seeps through the skin, and "motivates" the bowels? Have you or anyone else noticed this side-effect? Hmm. It seemed to start working well for me right away, but everyone's different, of course. My husband has noticed that he can often skip a day without noticing any odor problems, though, so there might be something to the idea of protection building up over time. I don't know about milk of magnesia, but magnesium chloride (aka magnesium oil) definitely absorbs through your skin. I'm surprised that the milk of magnesia had that effect on you with the small amount you'd use for deodorant, though, since one of the benefits of applying magnesium oil to your skin is that it bypasses the digestive system and thus allows you to supplement more effectively without causing bowel upset. It will be interesting to see if that side effect continues for you! You know, I let it go for a little bit, but I'm going to give it another try. It makes sense to me that it would seep into the skin, because the lymph nodes are right under the arm pits. Maybe I used a bit too much that day, but I just used a quarter-size dollop and smeared it into my skin, and the surrounding areas. As I suffer with constipation, it's not bad to have "encouraged" bowels, but I worry about developing laxative dependency or damaging my kidneys in this way. Then again, not only do people swear by MOM for their arms, they use it for their face to control acne and keep shiny skin at bay. If everyone were experiencing digestive upset, then it wouldn't be so popular, right? am gonna try this out. i have teenagers now and i could smell their armpits :( after school. it is quite embarrassing. i'll come back to this site whatever the results maybe. thanks for posting. I hope to hear how it works for you, Nuel! Dear Meghan, I had been researching the various forms and their uses of magnesium before I tried MOM for deoderant, but the info is difficult to obtain outside college, it seems! I finally found an unsweetened, little-known brand for only 2 dollars last night (12 oz. bottle, GeriCare from Dollar General) that I will use today and then report! You are delightful. You take the time to answer your readers and exhibit such love and concern for them! I will be back! Thank you, sweet Meghan! Thanks for stopping by, Lisa! As far as I can tell, milk of magnesia doesn't affect your ability to sweat. I'm not sure if there are any natural deodorant options that would help deal with excessive perspiration. I hope it works for you, Anna! I love how inexpensive and easy it is. Lisa, I always had a problem with sweating too. I was finding that commercial brands of deaodorant were not working at all. I had to apply them a few times a day. I starting looking on line for alternatives. I tried the homemade coconut oil based one...worked great. Now I'm using a mixture of baking soda and cornstarch (1 tbsp / 6 tbsp cornstarch). It works great too, in fact I prefer it to the coconut oil one. I found that when I started using it I would sweat even more! WHAT!? So I kept researching...and still kept using the powder mixture. I found out that was my body getting rid of toxins from the commercial brands. I hardly sweat at all now. I am also looking forward to trying the milk of magnesia. I just bought some! Thanks for sharing your experience, Yuri. I've been using regular Milk of Magnesia as a deodorant for 3-4 years now and believe me, odor is gone, no stains under my arms and of course you have to let dry before putting your cloth. Wow another great post. Great job Meghan. I am from India. I am thankful to you for bringing out the usefulness of Milk of Megnesia in tackling body odour (under arm odour). I came across this site while browsing the net for remedies to prevent under arm odour. I am using the milk of megnesia for the last seven days, I got rid of the bad odour. I will continue it. There is no burning sensation (which we feel while we spray a deodorant). It is also not harming the natural sweating of the body. Thanks a lot once again, I got rid of the under arm odour now, which I suffered for years,inspite of my trying so many deodarants. LET THE MESSAGE(M O M )GO TO THE WORLD. I'm so glad you had success with it! Thanks for letting me know, too - it's always nice to hear. Just picked up some MOM to try as a make up primer, but I'm also gonna try it as a deodorant. Thanks for the info!Keep it coming. I've been using a pinch of baking soda under each arm and it works amazing. No odor whatsoever! Pls can MoM work for my groin and foot odour? If no, any suggestn about what i can use, and if yes, which brand shd i buy? Pls reply. I don't know, Folly. I'd just try it out if I were you. It's only a couple of bucks for a bottle so you don't really have much to lose. Anything that's just plain milk of magnesia should work (just don't buy the flavored kind). I bought the generic brand (Kroger) at my local grocery store. Thanks so much. What ingredients must the MoM have (or not have) to qualify as a generic brand? Just look for one that only has magnesium hydroxide and water. By generic, I just meant that you can buy a store-brand (which are usually cheaper) rather than something name brand like Phillips. My store brand (Kroger) has worked well for me. Hi, sorry for disturbing u but the MoM i saw in my local grocery store is d phillips brand. Cant it be used? Oh yeah, it's probably fine, assuming it doesn't have extra ingredients in it. I just mentioned the thing about not needing to buy Phillips because here the Phillips was a lot more expensive. Just check it out but it's probably great! Pls meghan, i sent u a mail but u are yet to reply. HI. Nice article indeed. Well, i would like to know if milk of magnesia is fruitful in removing discoloration underarms because of the use of spray deodorants? I am not sure what you mean, Sharon. Can you clarify? Works great. I dab it on with the cheapest brand of round make-up remover pad, which is less messy than using your fingers and I'm pretty sure works just as well. And you use less. Thanks for sharing, Bob! That's a great tip. Hi Meghan I'm also facing over sweating and under arm body odor. Is there any side effect of using MoM to treat under arm body odor for long term. I don't know, Benin. I'd do a google search and see what you can find out about potential concerns with using liquid paraffin topically. Hmm. I have not read anything about potential concerns with using topical milk of magnesia long-term. Personally I would not be worried about it at all. But you can always do you own research and decide for yourself! Where would one find mty roll on bottles for MoM. My husband and I love it. No odor ever. Glad you like the milk of magnesia, Pat! As for the roll on bottles, I'm not sure, as I've never looked for them. I'd try Googling! Yes, I did. I used Lavender oil and Rosemary oil. In my 2 ounce spray bottle, I probably put 5-6 drops of each. It worked great. I have used Milk of Magnesia for over 5 years. A suggestion is put a little amount out the night before to thicken it. Thanks for this suggestion, Caren! I actually like it when it's thicker so I'll have to give this a try. I would like to know how pure MOM is....wouldn't there be chemical taint from industrial manufacturing and made with city water. Why wouldn't a spritz with homemade magnesium work just as good? Just wondering!!! Cindy, I honestly don't know how pure milk of magnesia is. Personally I'm not too worried about it--but that's just me. When possible I try not to obsess over the little details. As for your second question, I'm assuming you mean homemade magnesium oil? I haven't tried that so can't tell you how well it works, but personally I have a few reservations about switching to it for myself: 1. When I've used it on other parts of my body, magensium oil leaves an oily residue that I'm not fond of. 2. Magnesium oil can sting when applied to the skin, particularly if the skin was recently shaved or is otherwise broked. Since I shave under my arms this would be a big issue for me. If you do try the magensium oil, please let us all know how it worked for you! My mother has been using MOM for about a year, mainly because of concern that her sister had to have her lymph nodes removed, she loved it and encouraged me to try. I've used MOM for about 5 mo. now and love it. Especially love that I can hang a shirt up and wear it again without having to wash it! The next day there is absolutely no odor! Occasionally I have to re-apply in the middle of the day, thinking maybe I don't rub it in enough. I think I will try the roll on bottle or the spray bottle, just skeptical because when it dries up and gets flaky it will probably clog and leave a mess. Today I mixed MOM with baking soda to try thickening it up and give it a little extra power and maybe not have to re-apply. It didn't really sting, hard to say what it was doing but something was going on. Hope I'm not poisoning myself! Have you tried this? No, I haven't tried adding baking soda, but so many homemade deodorant recipes include baking soda so I'm sure you're not poisoning yourself. :) Good luck with the experimentation! I haven't showered for a week, and wanted to test it. I've changed my shirt daily and haven't had complaints of BO. But that's all without milk of magnesia. I just took my shirt off and can of course smell under my arms. I just put some milk of magnesia on a tissue, and wiped my armpits with it. I didn't shower first, because I wanted to really test whether it removes the smell. It has now been 10 minutes, and I can (still) smell my armpits. It's hard to say whether it has reduced the smell, but I can still smell my armpits. A disappointing result. It'd be interesting if others when they have smelly armpits, try it out and see if it removes the smell. I'd like to see other people test this. In my case the BO would've been dry sweat because I went a week without showering. But if others could test it with wet sweat that'd be interesting too. Or sweat only a day old. I can smell my armpits from the crux(this is the case even i've had a shower) but also I can smell them a bit from the middle of my armpits(normally a shower with shower gel removes that). I think maybe a shower with just shower gel, might remove more body odour from my armpits more, though it takes a lot longer. This was much quicker but I still have quite a smell. James, I wouldn't expect milk of magnesia to be able to combat odor after not showering for a week. From my understanding, it prevents the bacteria that cause odor from appearing in the first place--but I'm not surprised that it didn't do a good job of covering up the smell once it appeared. I agree. This is more of an anti-odorant rather than a deodorant. When applied to clean skin, it works fantastically. If you already stink, this will not make you not stink. Lavilin is amazing! It's an all natural, aluminum-free deodorant. Totally safe to use and great for delicate skin! I have been a happy customer for over 12 years and I have not once experienced any issues! I just bought some on my lunch break, planning to test it out tomorrow! Katie - you bought Lavilin? If so, thoughts?? I bought Phillips Milk of Magnesia. It works pretty well for a deodorant. Unfortunately, I believe that brand has bleach in it. Many store brands and generics are without that flaw. Wow! This is awesome! Funny too, because I set out to find some sort of OTHER natural deodorant (something without baking soda because, dang, it makes me get a horrible rash!) Anyway, I got sidetracked my my FB newsfeed and came across your article. SO glad I did! Is this product TOTALLY natural and healthy?? What exactly is it anyway? I'm really wanting to try it!!! Thanks! It's just magnesium hydroxide. Google milk of magnesia for more information. It's up to you to decide whether it's "totally natural and healthy"--but personally I feel completely comfortable using it for myself and my family. I tried this yesterday and wow, it worked. I had zero odor at all, even with normal deodorant I would still get an "odor" but with MOM -- NOTHING. Even into today. I vacuumed this morning, which normally makes me hot and smelly and NOTHING! Thank you so much for this information. This could change my life! I'm curious, there are other ingredients in Milk of Magnesia. How do you feel about putting those on your skin on a daily basis? I'm just trying to be as natural as possible. I have no idea if those other ingredients should raise concern. What other ingredients are you referring to? My bottle of milk of magnesia lists only water as an additional ingredient. A friend of mine recently turned me on to MOM as a deodorant, and I love it! I've only been using it for a couple of weeks, but she's been using it for a couple of years and swears by it. I also love the fact that I can hang up a shirt I've worn and wear it again without washing it because there is absolutely no odor. I've been taking magnesium supplements for years. My naturopathic doctor prescribed it for a chronic constipation problem I had, despite eating a diet that I should not have had such a problem with. Not only did the magnesium solve that problem, but it also stopped the leg cramps that used to come in the middle of the night. I guess I was severely deficient in that mineral. Now I'm thrilled that magnesium has come to the rescue as a deodorant, as none of the other natural remedies I'd tried had worked. And I don't see any reason to mess with a roll on bottle. I just apply it with a cotton make-up pad. Couldn't be easier. I heard that Philips MOM and Wal Mart's brand contain bleach in their products but that Walgreen's and CVS' private brands don't, so are a safer choice. Will have to try. I've been using a batch of homemade spray deodorant from a recipe I found on One Good Thing by Jillee. It's her recipe with Witch Hazel, Aloe Vera gel and various essential oils (mine has Lavender, Tea Tree and Sage oil) in it. I find I need to reapply it around 2 or 3 pm and it's a little runny. Do you think I could add some MOM to it to thicken it up to add some extra deodorizing power or would that compromise the effects of the magnesium? I don't see why that would be a problem. Great post!! I am new to your blog and want to check more of it out because it looks awesome. I have been using MOM for a few months and I love it!! It works really well. I started out using a cotton pad and pouring a bit from the bottle on it, and now I use it in a roller bottle with some orange essential oil. Best deodorant answer ever. All the baking soda ones made my pits burn. I have used milk of magnesia for about 18 years with great results. The way I use it is diluting it with water at 50% then pouring 2 to 3 ml in to the bottle cup to apply it under my arm. Works great. It was recommended by my Dermatologist in 1995. I have been using MOM for years now and LOVE it. I put on a sponge pad then use blow dryer and in seconds it is dry and no odor all day long no matter what I am doing. And no toxic ingredients. Could i use epsom salt which is magnesium in place of milk of manesia? For the past two months I have been using a deodorant purchased from a company in New York. The deodorant only has one ingredient, magnesium hydroxide. It works better than any other deodorant I have ever tried, ever. No odor all day and all night. Not a hint of odor. I was planning to purchase more of it last night, however, it is quite expensive at $12 per 2 oz bottle. I decided to search the internet to see if I could find a cheeper version of magnesium hydroxide deodorant. I found your article. It is exactly what I hoped to find. Thank you. I was curious that the name of the deodorant from the company in New York is called DeodoMom. That is a strange name. Now I think I know why it is called that. They may simply be purchasing generic Milk of Magnesia (MOM) and repackaging it in roll on applicators and selling it at a 3,500% markup. They may be hiding the ingredient right in the name DeodoMOM. The milk of magnesia HAD worked on me, but I'm starting not to like it that much. I keep getting painful bumps underneath my armpit. Is it because I don't dab the magnesia? I normally spread it on. I was purging my house, feeling so good about getting rid of the clutter and unnecessary things in my home, and came about a bottle of MoM that my husband needed to use after a surgery. I was so close to putting it in the trash, because I can't foresee any reason we would need it and my bathroom cabinet was overflowing. but something stopped me. SO GLAD to find this!! Can't wait to try it out. I love Milk of Magnesia as a deodorant. It works well on me. That homemade deodorant recipe that you linked has given so many people I know a yeast infection, not because of the coconut oil, but because of the corn starch. Corn starch is a sugar and it is known to cause rashes/yeast infections on babies bottoms when used as a diaper treatment. I love MOM, no sting, no allergic reactions and I have very sensitive skin. In the summer I use it on my feet. I get it at the dollar store, very plain and a dollar. I have used it on excessive oily skin, (I'm an esthetician and it cleans out your pores beautifully!). Interesting posts in regard to epsom salts and magnesium oil. I use magnesium oil regularly for muscle pain; will have to try it for deodorant. I try to eat a lot of greens and seaweed for magnesium and I'm sure I come up short, so I supplement with seaweed and spirulina. Anyway, MSM and magnesium oil can't be beat! Great article, thank you! Hello everyone, i read about the use of milk of magnesia as a deodorant. I am shocked at how it works. It is amazing. I live in Ghana, West Africa where it is extremely hot. I used it for the first time today after taking my bath in the morning..used it as directed here...i went throughout today sweating here and there, walking and alll that and nooo smell...i practically smelled fresh the whole day..Thanks for sharing this..i am definitely sticking to Milk of magnesia for life...no more synthetic deodorants!! I just wanted to say that I tried this after many attempts at finding a natural deodorant, and I have been pleasantly surprised. After burny rashes and super stinky pits with other natural deodorants, I can easily say that I am odor free for at least 24 hours with milk of magnesia. I've been using it for about two or three weeks, and I have loved the results so far. I discovered this natural deodorant about 6 months ago. I pour M of M in my old roll-on deodorant bottle and roll it on. I'm considering adding a touch of Witch hazel to aid in closing up my pores, but the M of M does a great job on it's own. The other recipes using oils or corn starch don't work nearly as well. You can get M of M at the $ store and make enough for your whole stinking family! "whole stinking family" lol How clever! Thank you for this! It's working well for me so far after a week or so. I'm doing the same thing as Michael, using an old roll-on bottle. It's more drippy and not as travel-friendly as the original crystal roll-on stuff, for some reason, but it makes application super easy. There is an extra ingredient in the Phillips' brand of Milk of Magnesia. Maybe the store brand (CVS) is the best one to buy due to this? Not sure if that extra ingredient is good for you or not. See below... CVS Milk of Magnesia Saline Laxative Original Flavor Ingredients: Active Ingredient (in Each 15 ml tbsp): Magnesium Hydroxide (1200 mg). Inactive Ingredients: Purified Water. Phillips' Milk Of Magnesia Original Ingredients: Active Ingredient (in each 15 ml Tablespoon): Magnesium Hydroxide (1200 mg). Inactive Ingredients: Purified Water, Sodium Hypochlorite. Just thought I'd mention it. My preteen has had highly sensitive skin since birth. We have to stay away from any kind of fragrance, which has made finding soap, shampoos, conditioner, and deodorant that won't cause a reaction a tiresome task. Her reactions look like chicken pox with scabs and it takes months of anti-itch creams to heal her skin. The dermatologist couldn't help me and they were not interested on helping me with a natural alternative. She has used everything on the deodorant aisle at WhOle Foods with no luck. Her BO issues have me searching again. I am glad we found site. I bought a bottle og Dollar General generic Mom since it doesn't contain bleach. Before we put it on her, I Mike 50/50 of distilled water and apple cider vinegar. We let it dry and then applied the Mom with a cotton pad. I will let you know our results. Believe me, we will know in a few hours. Thank you for a great site! Been using MOM as an underarm deodorant for a few years now and I love it. no product odor and dries fast too. Truthfully it works better,for me, than anything else on the market ever did. I learned of this a few weeks back & it's been working better & longer than anything else I tried. I add a couple drops of spearmint oil to the bottle to give it a scent but I wish I could find a refillable roll on bottle I could dispense it in. Does anyone know if any of the commercial roll on containers are reusable? I'd go get it just for the bottle. OK,I was using lemon, and then I heard citrus may be linked to Breast Cancer. No definitive study, but I'm concerned enough to say forget lemon. I would love to try MOM, but I am wondering if any of the ingredients have an Estrogenic effect? (I'm post menopause). And lastly, I was reading that the crystal deodorants at health food stores may not be 100% BC risk free either. I would have to do an analysis on MOMs ingredients to see if it's truly safe. The thing is, there are 118 elements and natural doesn't always equate to safe. Arsenic is natural. I have always developed severe lumps(boils) after the use of most commercial deodorants.Has anyone ever reported getting lumps from the use of milk of magnesia for a deodorant. Great post. I have used milk of magnesia as deodorant almost my entire life. During puberty, when I started to develop body odor, my mother bought me a deodorant. Two days after I started using it, I got a rash, so she took me to the doctor. The doctor told us that I was allergic to deodorants, so I would have to use milk of magnesia instead. I am in my middle forties and still use it. The only time I tried to use a different product my allergy showed up again, this time with a vengeance in the form of mustard yellow stains in my shirts. Turns out that my body's allergic response is sending a specialized type of white blood cells to the area where the deodorant is and they release a yellow substance in my sweat, the doctor said that the antiperspirant ingredients worsen the response. Long story short, deodorant lost, milk of magnesia won. Oh by the way the only thing I am careful when using it is when wearing sleeveless shirts or dark colored clothing. In those cases is better to apply a thin layer, and let it dry before wearing them, to avoid chalky color spots in the clothes (nothing the normal wash cycle can't take care of). Otherwise, I don't even wait for it to dry when I am in a hurry. Thank you! I get dark black arm pits and peeling skin from coconut oil/arrow root powder and baking soda. I'm going to try this. Has anyone had the dark peeling pits like me from the coconut oil deodorant OR milk of magnesium? Feeling hopeful! Thank you again!! Just make sure the MOM has 1200 mg of Magnesium Hydroxide. I bought some at dollar store and it didn't have it and it didn't work. User for a year! Husband laughed at me at first but now he's using it! I found if I pour a small amount (5-10ml) in the medicine cup and let it sit out overnight, the next day I have a paste- like consistency which is easier to apply and dries much faster. ( plus it's more concentrated and works better). Love how affordable and reliable this is! This is a great idea! Thanks for sharing. I'll have to give it a try. This is just the information I have been wanting to read. Many years ago a doctor team that had a column in the newspaper mentioned MOM benefits. I have kept the article, but ignored the use/benefits of MOM. Now full circle, I will be using MOM. Thanks again for your blog. Blessings to you. Good info! I plan to try the MOM soon! I am celiac and also have Hashimoto's. I react to everything! About a year ago I purchased the magnesium oil spray but every time I applied it I felt like my skin was ON FIRE! But now that I have read about other people's skin stinging..I am wondering if I should give it a try again! Reading that the stinging will eventually disappate gives me hope that I will be able to use this product again! I also had 12 mercury fillings removed 2 years ago and have not been able to detox with epsom salt bath due to the fact that our water is loaded with chlorine and flouride. Do you know of a fix for this beside an expensive whole house filtration system which is out of my reach? I am so happy I came across this post. If anyone can help me further..I would be very grateful!! I will try the deodorant ASAP. Do you think you can increase your magnesium levels by using this deodorant faithfully or is it such a small amount that it won't make that much difference? Thank you for sharing! Hi April, Just my opinion, but I think it's far too small of an amount to actually make a difference. You can for sure use magnesium oil over your whole body, though, which I think really would make a difference. You can also try oral supplementation. We do that in my house. For the bath issue, what about foot baths? Do you filter your drinking water? I'd use whatever water you drink and put that into an epsom salt foot bath. I LOVE using this for deodorant. I like that you don't have to mix it. I keep a bag of cotton balls on the counter in s small container and just put it on my arm pits with that. It works great!! As an emergency nurse, we frequently have intoxicated homeless people come into the department. The first order is "Don't take off their shoes". The odour can be really bad and spread all over the department. I've learned that letting them sleep awhile while putting their shoes and socks in a bag, and then giving their feet a light wash and then covering their feet with Milk of Magnesia takes care of the worst of the odour. I've been using this for many years, and it works like magic. Don't know why exactly, just that it does. No odor, for longer than any other deodorant ever tried. I will disagree with the author on whether it stains your clothes, tho. Over time, your black and dark clothing will gather a whitish stain under arms....but I sweat a fair amount, so it might just be me. I also wear my clothes longer than many. It's possible that the whitish stain is precipitated more by the MoM that I use around the rim of the bottle once it becomes thicker (has lost moisture). It is more concentrated and thus probably more likely to stain? I am also now wondering whether this is actually really a health practice, as we don't tend to absorb magnesium well in the diet, and I'm wondering if I'm absorbing it thru the skin on a daily basis. Anyone know anything about this? I have been using milk of magnesia for about a year. Found it in the comments of a natural deo recipe blog. Wish more people knew about this and I knew sooner. My baking soda recipes used to turn my pots black and peeling ouch! Anyway has anyone noticed a crusty white residue that's hard to get off even in the shower? Usually when I use the thicker goop found near the cap. ;) I also got some painful lumps under my skin like I used to get with toxic drug store deos from the goopy part I assume. I freaked out. I live in Canada and the only mom I can find has absorbic acid I think it's called found in pickles and applesauce. But no bleach I triple check the ingredients every time I buy. Maybe the absorbic acid gave me the lumps? any help appreciated! Thanks! P.s. Has anyone found a spritzer to fit the wide mouth bottle? I don't change it's bottle as I read mom has to be kept in a dark opaque bottle out of light? 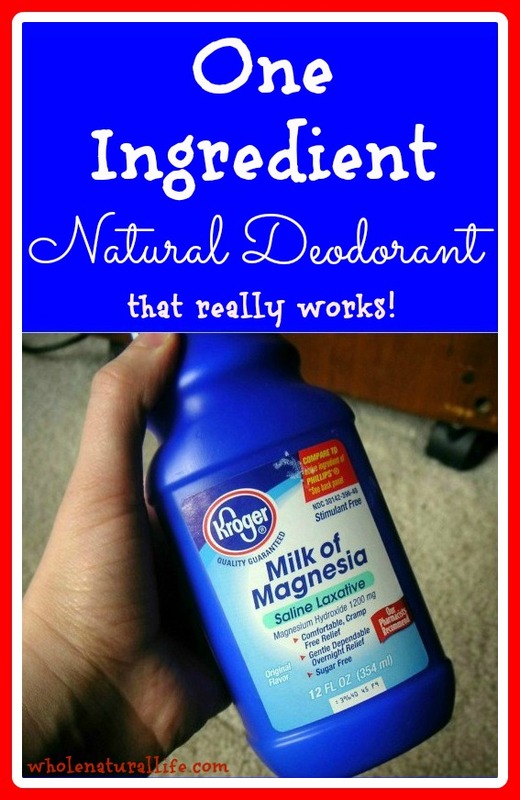 I have been using Milk of Magnesia as a deodorant for a few years. Other homemade/natural deodorants that used baking soda and coconut oil irritated my skin. I put my MoM in a small travel sized lotion pump bottle to use. I have also added a few drops of essential oil to it--I like tea tree and lemon oil.